I have been a fan of the Transformers since 1986. I wasn't able to collect all the toys then but I do have a decent collection. 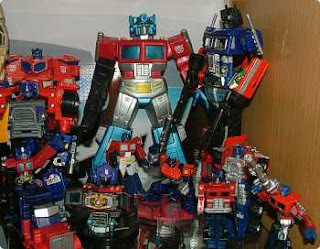 I'm particularly proud of my Optimus Prime collection. Also, I've been a follower of their evolution from their simple diaclone pre-Transformers Japanese toy appearance to their current form and storyline. You could say I can pass for a Transformers historian. I have mixed reactions on the newest release of the Transformers saga, being Transformers The Movie. I may be considered a purist for admiring the original storyline and first generation of transformers. I wasn't too thrilled with the new looks of the original cast of transformers characters. As hi-tech as it looked, I didn't like their complex transformations. I did want to appreciate the special effects but the camera had its panning set to frenzy. I would've appreciated it more seeing the robots transform from one angle and camera shot. Knowing that there are hundreds of characters included in Transformers Universe, I was disappointed to see only a handful of them introduced and used in this movie. It may be intentional for a possible sequel, plus I understand that the movie is limited to time constraints, but whether there'll be a successor to this movie or not, there are much unused characters, plots, personalities and history which could've made the movie more exciting. On the other hand, all the hype of the transformers has led to a renewed interest for those who used to watch their cartoon when they were kids as well as a new generation of youngsters who now know who Optimus Prime and Megatron are. Aside from their new transformations, the original toyline and its variations are also being brought back, not to mention at a much affordable price than before. Overall, I am pleased that the transformers are back. And I hope after this movie, there is still more that awaits the eye. I liked it. =). everything is exploding left and right. as I've said in my blog, Michael Bay is a maniac. Megatron's look is completely different to the one in the series and i wished they had him him transform into a gun like he does in the series. And it's not as tear-jerking as the movie where Prime died. But all in all, it was okay. Don't get me wrong. 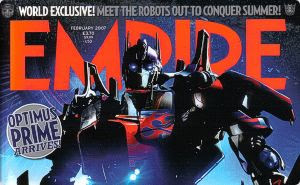 I love anything about the transformers, including this movie. The actions scenes were non-stop. The humans didn't seem to have much impact on the movie though.